The plethora of outdoor pursuits is not what lures us back. Instead, it’s the chance to carry on our community's rich agriculture heritage, steering us to a more sustainable and resilient future. Chris Frentress is a fifth-generation farmer on a homestead alongside the Yampa River outside of Hayden. Now strictly crop farmers, his family has raised everything from wheat and alfalfa to safflower barley and oats, along with cattle. Frentress graduated from Hayden High School in 2005, then earned his degree in ag-business from Colorado State University in 2008. Upon his return, the Frentress Farm has adopted what he describes as a continuous-crop, no-till system. Eliminating the need to “work the soil” saves money in labor and diesel costs. Along with making economic sense, this new approach to land management makes ecological sense. The no-till system is expected to increase yield and drought resistance while decreasing soil erosion. “No-till farming promotes soil health by encouraging microbial activity, increasing organic matter and decreasing the need for chemical fertilizers. 2014 was the third year using the no-till system, and already we've seen increased yield,” Frentress says. A three-year Conservation Innovation grant enables Frentress to test alternative crops in partnership with the Routt County Conservation District. Experimental crops include quinoa, sunflowers, flaxseed and garbanzo beans. Although there is not yet a market for such products, Frentress is confident these crops hold the potential to simultaneously offer the farm another income stream, improve its soil health and localize a small part of the food system. While the Frentresses are exploring new methods of production in hopes of eliminating the need for diesel fuel, one neighboring farm has preserved the practice of using draft horses in place of tractors. 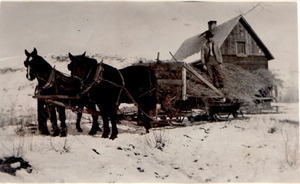 Charlie Fulton, Ryan Wattles great-grandfather, with his draft horses circa 1920. The Wattles family has bred cattle and draft horses on their farm straddling the Yampa River outside Hayden for four generations, going back to the mid 1920s. Raised on the farm, Ryan Wattles graduated from Steamboat Springs High School in 2001. He left the valley to serve in the Army for six years before going to Colorado State University to study rangeland ecology. Marrying his high school sweetheart, Ryan and wife, Rachel, returned from Fort Collins to the family farm in 2010. Now parents of two daughters, Sidney, 4, and Lucy, 2, the duo has been encouraging their girls to help with the pigs, goats, egg hens and ducks while cultivating an ever expanding vegetable garden. Currently the Wattles are awaiting county approval for a new family-oriented bed-and-breakfast, The Horse and Hen, which aims to provide hands-on farm stays. Milking the dairy cow, collecting eggs and driving the draft team are a few of the daily activities guests may experience. “The farm-stay has really been a good fit for us. We really love sharing our lifestyle with others and giving people the opportunity to learn more about agriculture,” Ryan says. Wattles’ plan is to provide the family with high quality food, grown and raised right on the farm. “We’ve put ourselves and our beliefs on the line, and have created a business that we believe in. In some way I feel that we’re honoring the generations that came before us by using the knowledge, land, ideas and practices that have been passed on to us,” Rachel says. Along with feeding themselves, the family is selling goods at the local farmers’ market during summer, and on the Community Agriculture Alliance's online co-op. The Brodman family, which recently entered the world of farming, is also capitalizing on opportunities offered by the alliance. Nissa and her husband, Tim, bought their farm in 2012. Although they each have family members involved in agriculture – Nissa’s dad has a ranch on Twentymile Road and Tim grew up on an organic farm in Iowa – they did not inherit a turnkey farm. Instead they have been rehabilitating a turn-of-the-century homestead cabin on their modest 20-acre farm north of Steamboat Springs. The Brodman's home is a work in progress. Nissa and Tim met during their time deployed in Honduras. Nissa, a Blackhawk pilot, was flying MEDEVAC for humanitarian purposes, in conjunction with U.S. training missions. Tim, a member of the Air Force, was in charge of maintaining the airfield at a Soto Cano, a joint base. Neither had intended to return to their hometowns or to pursue agriculture as a way of life, but an interest in self-sufficiency starting with four chickens in their Savannah, Ga., backyard, eventfully led them back to Steamboat. “Our goal to live off the land is slowly being realized. We originally set out to feed ourselves and our family, but now we're looking at how we could feed some neighbors,” explains Tim. The planned addition of a greenhouse will extend their growing season, allowing them to supply produce to sell at the farmers’ market and online through the co-op. The Community Agricultural Alliance is supporting Nissa’s efforts to navigate commercial regulations for future business opportunities. The Brodmans have launched The Little Penny Cart, providing farm fresh chicken and duck eggs, as well as “Meow Milk” goats milk, a nutrient rich pet food supplement, which they hope to expand into a viable operation. In the meantime, Nissa, Tim and their two daughters, Violet, 3, and Lidia, 1, explore the challenges and triumphs of modern day homesteading in Northwest Colorado. 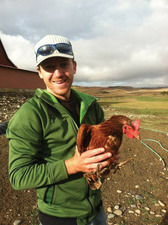 Both Tim and Nissa work part-time in Steamboat to supplement the farm income. “Without the social interaction that my work at Horizons provides, it would be just me, my 3-year-old and the goats,” Nissa says. As for me, growing up in Steamboat and graduating from Steamboat Springs High School in 2002, a college internship on a student-run Community Supported Agriculture farm at Montana State University started my exploration into food production. Upon graduating with a degree in political science, I moved back to Steamboat in 2010, with a continued interest in local food production. I handled my first livestock as a dairy farmer with Moon Hill Dairy. Continuing my goal of localizing the food system, I took a job in 2012 as a ranch hand and retail sales manager with Yampa Valley Farms, where I continue to advance the local food movement. A newcomer to agriculture, Charlie Peston Townsend is inspired to localize the family's food system. Realizing the demand for locally sourced food sparked the creation of Farm-to-Fork Delivery in 2014. Providing a direct connection to area producers, Farm-to-Fork aims to provide marketing and distribution opportunities to local producers, along with providing a one-stop source of local products to customers. Local food production is difficult. Luckily there is help available that several of us have utilized. The Community Agriculture Alliance has been promoting agriculture in the Yampa River Valley since 1999 and working to ensure the vitality and continuity of local agriculture. Its online marketplace gives customers direct access to area producers, including Little Penny Cart and the Wattles Farm. While the paths that led all of us to return to the Yampa Valley differ, our goals are similar: to ensure a healthy future for our families and the local population. The agricultural heritage that is at the root of the Yampa Valley lives on in a new generation of dedicated individuals, determined to bring real food to the tables of our community.